Direct From Industry: BPA Students Are Career Ready, But Who Knows It? 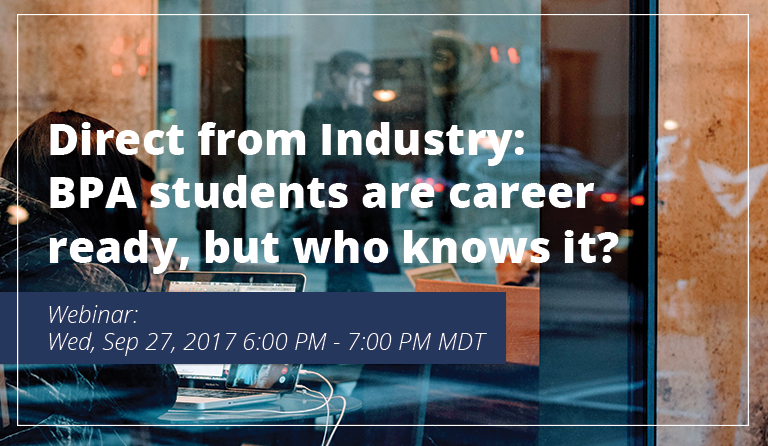 Thanks to all who joined us for the webinar, “Direct From Industry: BPA Students Are Career Ready, But Who Knows It?” And, a huge thank you to our wonderful partner, Business Professionals of America, for hosting the event! It’s no secret that industry and education speak different languages. After listening to and working with hundreds of education and industry partners, Precision Exams wanted to talk with educators about how collaboration between industry, government, and education leaders can best produce programs to place high school students on the fast-track to a fulfilling career and enhanced educational opportunities. During the webinar, we answered some great questions and discussed what industry is saying and how educators can help students convey the skills and knowledge they’ve acquired. You can find the full webinar here; we promise that we shared some great information. For a quick look at the topics covered, you can find the slides here. If you have any questions or would like additional information about our exams, please feel free to reach out. We got you covered. Up-to-date statistics about CTE programs and students. Lessons learned from committed industry partners engaged in supporting CTE curriculum. Tips to help students demonstrate the skills and knowledge they learned that will help them get a job.